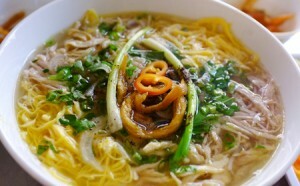 Amo ng the many rice vermicelli dishes of the north, bún thang is considered the most difficult to cook. It has plenty of toppings: chicken, fried chicken eggs, chả lụa (Vietnamese pork roll), long coriander, Vietnamese coriander, and nấm hương (shiitake mushroom), all shredded or cut in strips. There is also salted duck egg cut in half, shrimp floss, and tôm he (a species of prawn). It is eaten with vinegar, garlic, chili, pepper, and, sometimes, mắm tôm (shrimp paste). Another accompaniment is fermented turnip. Vu Bang, a Hanoian writer, once described the presentation of the dish as a “cubist painting” that looked “cheerful” and “precious” in his famous foodlogue Miếng ngon Hà Nội (Hanoi’s tidbits). If you are in Hanoi, it is not difficult to find a restaurant that sells good bún thang. In fact, an array of restaurants can be found along Cau Go Street, the standouts being at Nos 32 and 48. Other famous restaurants include Thuan Ly (2 Hang Chi Street, Hoan Kiem District) and the one at 11 Hang Hom Street. But it is different in HCMC, where many restaurants, despite advertising the rice vermicelli as one of their main dishes, fail to present bún thang with all its original flavors. One of the few restaurants hailed by gastronomes and culinary writers for serving bún thang of agreeable quality in the city is Bun Tan Dinh on Dinh Cong Trang Street, District 1. The bún thang sold here is known for its soup, which has moderate amounts of spices, cooking oil, and fat. The distinctive soup successfully makes up for the absence of tôm he that is unavailable in the south. Thuc, the restaurant’s 72-year-old Hanoian owner and chef, calls bún thang a “noble” dish and not one created to make use of leftovers after Tết (Vietnamese Lunar New Year), as many believe. She points out that tôm he is an expensive and rare species of prawn. Thuc, who owns the restaurant with another old woman and an old man, also explains the origin of the dish’s name, which confuses lots of Vietnamese. Many people believe thang is a homonym of thang as in thang thuốc (medical prescription) since the dish has many flavors like a traditional medical prescription that consists of various herbs. But Thuc says that is not true, explaining that thang actually means ladders. When she was young, elders in her family would often pile bowls of bún thang like the steps of a ladder on her ancestors’ altar during Tết. Besides bún thang, her restaurant also sells other northern rice vermicelli dishes like bún chả (with grilled pork meat, fresh herbs, and sweet and sour sauce), bún mọc (with pork ribs, minced pork meat balls, chả quế – baked pork roll with cinnamon powder – and fresh herbs), and bún cá thì là (with steamed and deep-fried fish paste, tomato, pineapple, and dill). Open hours: 6:30 a.m. to 1 p.m. Some people refer to the rice vermicelli dishes sold at Bun Tan Dinh collectively as bún nhàn rỗi or rice vermicelli of leisure. The reference is to the fact that the owners opened the restaurant just to kill time and cook the food and serve their customers in a leisurely manner but with great care, according to Sai Gon Tiep Thi newspaper. “We serve gourmets who have free time to enjoy the food,” it quoted Thuc as saying. The restaurant is open from Tuesday to Saturday and sells only one dish in a day except on Saturdays. Bún thang is available on Friday and Saturday, bún chả on Tuesday and Thursday, bún cá thì là on Wednesday and Saturday, and bún mọc on Saturday.